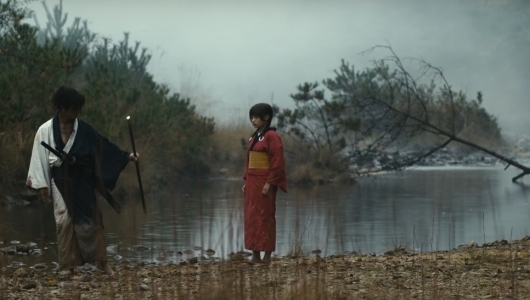 The lethal dose of violence in 13 Assassins is heightened to such a degree of ferociousness, and yet never does it come off as an overwhelming force that serves as an impediment to our enjoyment. Rather, it plays out to resemble a macabre, lyrical meditation that we gawk at, despite the many severed limbs and decapitated bodies. 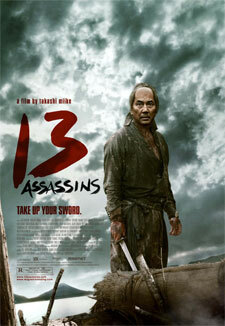 Instead of being confined to the suffering grounds of 19th century feudal Japan, where bodies writhe in perpetual anguish in the dirt due to swords piercing into human flesh, 13 Assassins identifies with human elements like integrity, devotion, self-sacrifice, and loyalty that all samurais universally adhere to. This is not to say that the film bypasses all things representing violence. There is a battle scene that lasts the film’s final 50 minutes. It is astoundingly coherent and enthusiastic in showing its infatuation with bloody violence, all while maintaining an artistically composed countenance.